Maytex Jardin Blackout Window Curtain Panel will block out 99% of sunlight and help you save on energy costs by insulating any room. The thermal lined backing innovatively blocks out cold drafts in the winter and absorbs heat in the summer. The noise reducing curtain will add a bit of privacy and comfort to living rooms, bedrooms, nurseries and more! The Jardin Blackout Curtain is perfect for creating a serene atmosphere for daytime sleepers and will help children experience a more peaceful rest at any time of the day. Jardin Room Darkening Window Curtain features a beautiful embroidered leaf design adorning soft faux Silk fabric. Each Window Curtain Panel measures 54" width x 84" length. The metal grommets are designed to fit standard 1.5" diameter rods and will glide smoothly across the window rod as you open and close your curtains. The Jardin Blackout Window Curtain is machine washable for easy care. One window curtain panel is included per package. Dimensions 84.0 In. X 54.0 In. X 84.0 In. These are beautiful curtains, and they do effectively block heat, and cold. I bought them in the burgundy color, and so glad I did. These curtains offer so much in the way of style, and the grommet top makes them very easy to open, and close. They are a great deal for the price-you won't be dissatisfied. I wanted something on the window to help keep the heat in but not clutter up the room. I like the subtle leaf design and how easily they pull back and hang. Love the curtains! Nice material! This is my 3rd pair of curtains for my newer house and these look and work wonderfully. I have received a lot of compliments on these curtains. Best yet, they do reflect the sun so my living room doesn't get so warm with the afternoon and late afternoon sun. They do block out some light but it's still very bright in the living room when the sun is shining. I highly recommend these curtains. I placed these insulated curtains in a room where I have 8 windows. Now it is kept very comfortable winter and summer. They wash nicely, but you have to hang to dry. It does keep most of the light out. Some light comes through, but it does not disturb the sleep. In fact, when the light does come through, it's a very soft light and you can see the tiny leaves on the curtain and it is very pretty. I purchased these drapes for my downstairs family room that tends to be a bit cooler than the rest of the house. Not only do they block the draft and add warmth, but they enhance the appearance of my sliding glass doors, where they hang, and also add their own unique touch to the entirety of the room as well. Then, there is the impressive price...the icing on the cake! Try a slice of this nice pair of draperies; I assure you, you will be happy that you did. I spent hours ironing. I tried the dyer solution to wrinkles but it didn't work. The curtains still have wrinkles. I will probably investing in a steamer machine. That said, the curtains look absolutely fabulous! This is one case in point where a photo doesn't do the product justice. We bought the burgundy color. It's so very luxurious. The icing on the cake is the pinpoint light holes in the fabric look like diamonds when back lit. We rent and we have old windows. The light, noise and outside temperature mitigation is far more than we had hoped. I really love these drapes! Ironically, they make our small space look so much bigger. My expectations on all levels is exceeded. I purchased only one panel trying to match my newly renovated living room. Color matched perfectly and the weight for the thermal drape was exactly what I was looking for. I will definitely finish purchasing to complete all my windows. Color was as expected and they look lovely. Black thread on silky slightly shiny dark sky blue fabric. No loose threads. Grommets are dark brown/brass looking. In the picture, the leaf pattern looks fairly subtle, maybe gray. But actually the leaves are made of gold metallic thread and they really stand out. 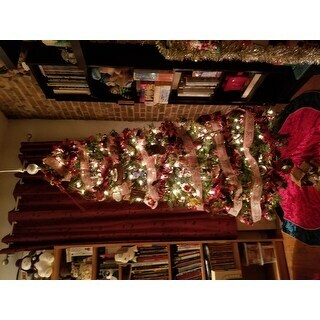 it's a fairly showy look. I returned the curtains. Bought these in burgundy, and they came out absolutely beautiful! Especially during the holidays! They keep our living room warm, completely darkens the area which is great when we have guests overnight! Great quality, durable and wash really well! Good quality blackout curtains. Worked for us! These curtains look nice and are easy to hang. Block out light fairly well when closed. I love these curtains so much I ordered more of them. Everyone who visits gives positive comments. I washed them on the delicate cycle and hung them to dry. So very happy that they dried wrinkle free. I would highly recommend them. These are decent curtains but they are very shiny and the embroidery was larger than expected. Didn't fit my style, returning these. "On the natural drapes is the leaf design gold? I couldn't enlarge it in that shade to be able to tell." In my opinion, the design is a darker version of the background color. "What color is the backing of the natural color?" "Is this the price per panel or per pair?" 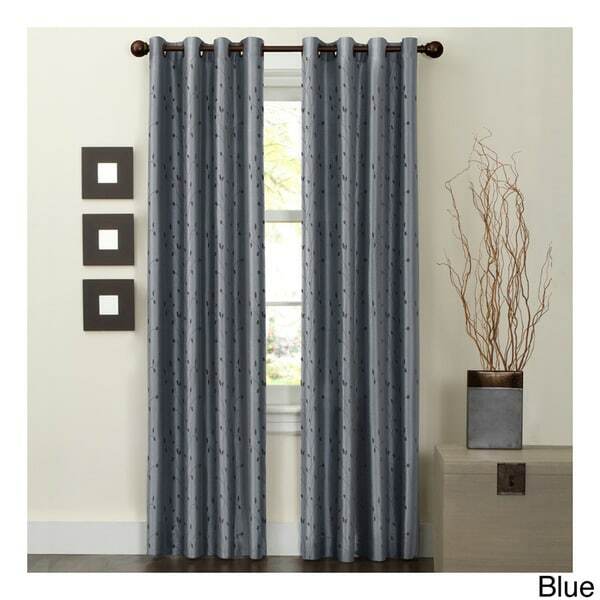 The Jardin Embroidered Thermal Lined Energy 84-inch Curtain Panel price, is for one panel. "I'm very interested in these panels but i would like to see a close up of the fabric/embroidery before I decide. Thank you." Hello sheeshka, you can click on the large photo and then continue clicking to zoom in. Thanks for shopping with us! Because it was very pretty and it looked like it would match other material in our bedroom. Also the price seemed right. I have them in my daughter's room and they are very helpful in blocking out CA sunshine and ambient light at night. You sold out of Jardin Faux silk in Natural and I needed two more, Closest I could find. "Do these curtains hold as much heat and block as much light as thermal drapes which are made out of solid polyester or cotton. For example, do they work as well as the other thermal drapes on overstock that look thicker and less shear?" Hello miritf, yes these work just as great as the polyester and cotton panels. Have a great day! I had these only my window during the summer. No, they don't create blackout. They did OK with the summer heat, but I think not as well as the heavier drapes. Of course, it also depends on the color of the drape. I did take them down for the winter and put up a heavier pair. "what color metal are the actual grommets?" Thank you for contacting us, grommets. The grommets are oil rubbed bronze color. Please let us know if you have any further questions.